It's hard to find someone for whom the name "Ferrari" and "Maserati" would remain a mystery. But only few people know that these world-famous brand cars were manufactured in Modena. Here is the birthplace of the car founder Enzo Ferrari, the great opera singer Luciano Pavarotti, Vasco Rossi racer. Modena attracts gourmets from around the world by its sparkling wine «Lambrusco», a variety of cheese specialties and delicious pork dishes. 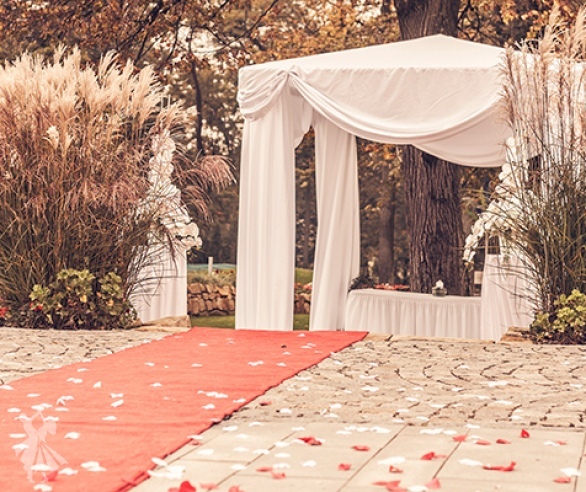 For those who plan their weddings in Italy, in a warm, cozy and beautiful place surrounded by magnificent scenery of the ancient city - welcome to Modena! The city is situated in the middle of the Emilia-Romagna region, in the northern part of Italy. In this region the continental climate prevails, characterized by hot summers and cold winters. 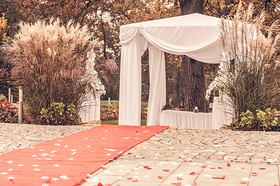 The best time for weddings in Modena is from April to October, when the nice, warm, and sunny weather is setting up. July and August are the hottest months in Modena. The thermometer reaches, in this period, a temperature of 30 degrees. The convenient transport arrangement allows anyone to get to Modena without too much difficulty. 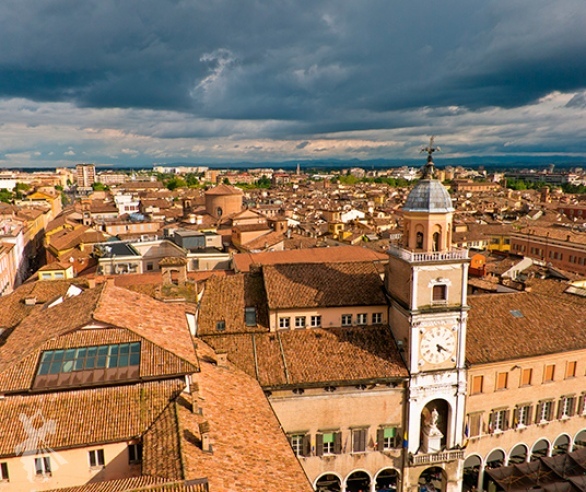 Having arrived in Bologna - the capital of Emilia-Romagna, in 20 minutes it is easy to get to Modena by train, which operates every half hour. Italian Wedding agency, also proposes to use an individual transfer Bologna - Modena, on a comfortable car. For more information about how to get to Modena, please contact the Italian Wedding agency. Piazza Grande is the central area, located on the former site of a Roman amphitheater. It ruins still serve as a memory of the harsh times of the Roman Empire. There are also emblematic monuments of the city, like the Ghirlandina Bell Tower with a height of 86 m, built in 1179. Modena Cathedral absorbed all the artworks of the greatest masters of painting and sculpture of the Middle Ages. Ducal Palace - a Renaissance building and one of the most important monuments in Italy. Art Galleries - where you can see a large collection of paintings from the 14th to the 18th century. Ferrari museum, an especially popular museum, which is located in a small town near Modena, Maranello. Here, exhibitions of racing and vintage cars "Ferrari" are organized. 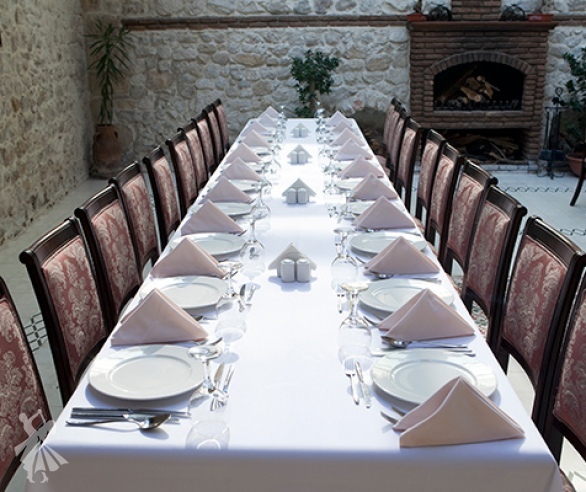 A wedding in Modena supposes tasty and amazingly delicious food. It will be difficult to resist the abundance of cheese, ham, sausages, or without trying the pork specialties, for example, ham and doughnuts filled with hot cheese - "Tidzhella." The world-famous sparkling wine “Lambrusco” will become another symbol of your holiday in Modena. 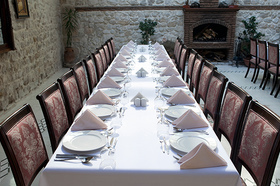 And many other delights will be especially prepared to satisfy your dream of getting married in Italy. Modena is a city with a fascinating hospitality, rich in history, part of which may become your love story. 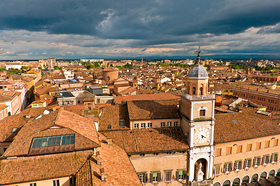 Modena welcomes its guests with its unsurpassed architectural buildings, ancient monuments and sculptures. The center of the city is endowed with a special beauty, where spectacular wedding are organized and street musicians’ performances occur.